Below is an update of activities and conditions expected in Algonquin Park between Christmas and into the New Year. For more information see Winter in Algonquin Park or the suggested links below. Snow - As of January 1, 2019, the snow depth recorded at Algonquin Park's East Gate is 35 centimetres. Snow depth in Algonquin Park is recorded hourly at the Park’s East Gate. A daily summary of snow depth from Algonquin Park’s East Gate is available on the Algonquin Park Weather webpage. Waterbodies - All lakes in Algonquin Park are now frozen, but ice thickness remains thin and unsafe. Temperatures dipping to -24°C in early December froze many lakes including the easily observable Lake of Two Rivers (see below for more information). Based upon satellite imagery, Lake Opeongo and Lake Lavieille which are traditionally some of the last lakes to freeze based upon their large size/volume were ice and snow covered on December 15, 2018. January 4 (2016) was the latest recorded date for the complete freezing of Lake of Two Rivers since detailed record keeping began in 1972. In contrast, the earliest freeze date recorded was November 28 (1995). This year Lake of Two Rivers was completely ice covered on December 4, 2018. Shallow lakes and ponds are ice covered with a thin layer of ice. Fast moving water remains open and can remain so for the winter. Visitors should always use caution around moving water in winter, and also avoid ice travel due to a range of environmental variables and the difficulty in detecting hazards. Roads - Highway 60 is plowed and maintained throughout the winter months by contractors for the Ministry of Transportation. For road conditions, see Highway 60 traffic cameras offering recent images of road conditions in Algonquin Park or consult the Ontario 511 webpage. Most secondary roads leading to Access Points or other facilities are closed for the winter and not maintained by Ontario Parks. Check Winter in Algonquin Park for more specific details. Visitors looking for a plowed secondary road for wildlife watching or recreational activities might consider the Opeongo Road at km 46.3 of Highway 60. New winter gates have been installed at the Arowhon Road and Rock Lake Road to close these roads to public travel during the winter months as Ontario Parks does not conduct winter maintenance. See Algonquin Park Advisories for more about winter road closures. Closures - Park visitors should check the Algonquin Park Advisories webpage prior to each visit for temporary closures of campsites, trails, roads, and other facilities that may impact their visit. Live View of Algonquin Park - Watch the live video and images from the Algonquin Park Webcam for up-to-date conditions in Algonquin Park. West Gate and East Gate - The West Gate and East Gate are both open for the winter to provide Park permits and information. Check the Events Calendar for specific details. Self-serve fee stations for Park permits are available during non-operating periods (such as December 24 and 25, or prior to normal operating hours). 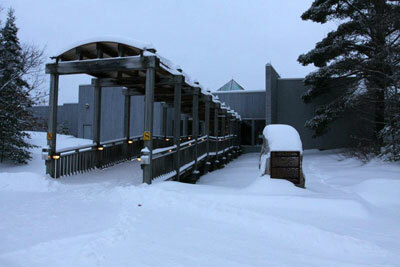 Visitor Centre - The Algonquin Park Visitor Centre is open daily during the winter (except December 24, 25, 26). Check the Events Calendar for all the details. The Visitor Centre offers Park permits, information, bathrooms, the Bookstore and Nature Shop, the Sunday Creek Cafe, exhibits, theatre, observation deck, and more. Bird feeders are also in operation providing a sample of Algonquin Park’s bird-life. See the Birding Report for the latest Visitor Centre sightings. Special Art Exhibit - View the Algonquin Park related works of the Brown Baggers painting group in the Algonquin Room at the Algonquin Park Visitor Centre. All art is available for sale, and a portion of proceeds support educational intatives in Algonquin Park. This special exhibit is open the same operating dates and hours as the Algonquin Park Visitor Centre. Check the Events Calendar for specific dates and times. Skiing - Algonquin Park's nordic (cross-country) ski trails are now open for the winter season. Check the latest ski trails conditions as fluctuating temperatures and new snow may alter conditions. Ice Rink - The skating rink within Mew Lake Campground is now open for the winter. If you are coming to Algonquin Park pack your skates and hockey sticks. The Mew Lake Campground ice rink is located near the heated comfort station and has lights for evening skating, a campfire pit with wood, a hot tent for warming up, and hockey nets. Please note that the ice rink may be closed by Park staff during periods of above freezing temperatures to preserve ice conditions. Check at the rink for important notices. Interpretive Walking Trails - Algonquin Park interpretive trails remain open during the winter. When snow deepens, check the Winter in Algonquin Park webpage for a list of trails with plowed parking lots. Park visitors should use caution on interpretive trails during the winter months as trail maintenance concluded in October. Watch for fallen trees and other hazards. Guide booklets are removed from trailhead dispensers for the winter but are available at the East Gate, West Gate and the Visitor Centre, or by ordering online. Whiskey Rapids Trail - closed for winter. Centennial Ridges Trail - the gate at Centennial Ridges Road and Highway 60 is currently closed for the winter requiring an additional 2 km hike to reach the Centennial Ridges Trail. Mizzy Lake Trail - A winter gate on the Arowhon Road still allows access to the Mizzy Lake Trail parking lot during the winter months, but no road access is possible north of the Mizzy Lake trail head parking lot. See Algonquin Park Advisories for any additional updates or closures. Snowshoeing - Snowshoeing enthusiasts can go virtually anywhere except trackset ski trails (Fen and Leaf Lake). If you prefer to stay on marked trails, visit the interpretive walking trails, the Western Uplands or Highland Backpacking Trails, or the Minnesing Wilderness Ski Trail or Old Railway Bike Trail where snowshoeing is permitted. 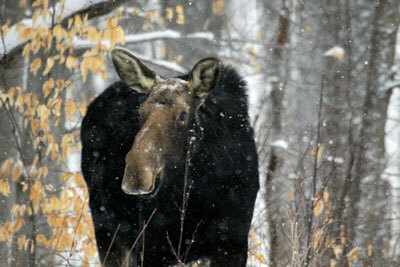 Wildlife Watching - Wildlife watching can be rewarding during the winter months. Check the Algonquin Park Sightings Boards at the Park Gates and Visitor Centre for the latest sightings, or for bird updates check the weekly Algonquin Park Birding Report. To spot wildlife, carefully drive Highway 60 or other secondary roads, or better yet, walk or snowshoe a trail (see above). Food Services - The only food service facility available in Algonquin Park during winter is the Sunday Creek Cafe at the Algonquin Visitor Centre. Operating hours are the same as the Visitor Centre. Please note that the Sunday Creek Cafe is not available during periods of “limited service” but a self-serve snack bar is available during this period. See the Events Calendar for details. Gasoline - No gasoline or diesel is available in Algonquin Park during winter. Fill up your tank in neighbouring communities such as Dwight or Whitney if visiting the Highway 60 Corridor. Camping - Two forms of camping are available during the Christmas/New Year’s period (and throughout the winter months). Mew Lake Campground offers developed camping for tents and RVs with a choice of electrical or non-electrical sites. A heated comfort station with flush toilets and showers is always available. Mew Lake Campground sites are reserved on a first-come, first-served basis, with additional campsites always available with staff opening the Lake of Two Rivers Campground if Mew Lake becomes full. Visitors wishing to stay in yurts must reserve in advance. Backcountry camping is also available year-round. Most backcountry campers explore the Western Uplands or Highland Backpacking Trails on snowshoes. Check Winter in Algonquin Park for more details. Roofed Accommodation - No roofed accommodation (other than reservable yurts at the Mew Lake Campground) are available in Algonquin Park in winter. To find accommodation providers outside Algonquin Park in neighbouring communities, search the Commercial Service webpage. Weather plays a major role in any visit to Algonquin Park especially during winter. Park visitor should monitor weather conditions closely during the winter months. For the latest weather information and recent conditions see Algonquin Park Weather. Winter visits require special preparation and attention to safety and equipment. On any trip it is wise to tell someone back home your exact itinerary and expected return date. Even following this advice, and the fact that the Park staff do patrol the Park, it cannot be taken as assurance that you would be found in time if you were to become lost or have a serious accident in sub-zero temperatures. Cellular telephone coverage is not Park-wide; generally it is limited to 3 kilometres on each side of Highway 60 and, even in this area, service can be "none" to "limited." Your safety in Algonquin Park – as elsewhere – is ultimately your responsibility. Be prepared for winter in Algonquin Park and you will undoubtedly have an enjoyable visit!